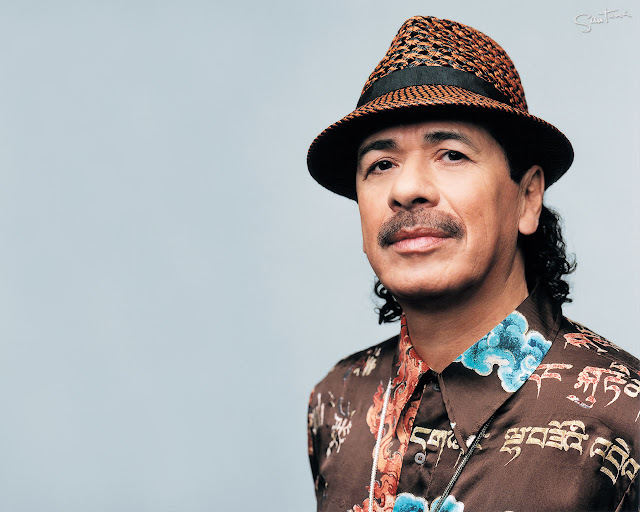 Carlos Santana knows the power of a good guest vocalist: His 1999 album Supernatural, which paired the guitarist with a youthful cast of star singers, sold 28 million copies. His forthcoming Guitar Heaven (out September 21st) tweaks the formula, teaming Santana with singers to cover a healthily diverse mix of guitar-centric rock tracks. (See the song listing below.) Santana invited three of his new partners — Chris Daughtry, India.Arie and Gavin Rossdale — when he debuted the album last Wednesday, in a special edition of his residency at the Las Vegas Hard Rock Hotel. Chris Daughtry, who met Santana for the first time in rehearsal, offered a spirited take on Def Leppard’s “Photograph.” “I don’t have the Joe Elliott range, but I’ll do what I can with it,” Daughtry had warned, but he nailed all the big notes and brought the crowd to its feet. Gavin Rossdale bounced around the stage while singing T. Rex’s “Bang a Gong” and the evening’s highlight, “She’s Not There” by the Zombies, which morphed into a free-form jam as Santana issued precision licks and wails of feedback. Earlier in the day, Rossdale gushed about a prized memento from the Guitar Heaven recording sessions: a “gracious and mind-blowing” thank-you note from Santana, which the Bush singer says he has affixed to his bathroom wall. “You see Carlos onstage and the way he approaches the instrument and the passion he brings to his music,” Clive Davis said after the show. “Ecstasy is the word, when you see him playing.” Davis, meanwhile, literally crossed his fingers when suggested Guitar Heaven might reach the commercial heights attained by Supernatural. Santana’s passion — and Rolodex — can’t even guarantee that.